CAPTION: Former Serb General Ratko Mladic is sought on multiple genocide charges which include Srebrenica and genocide in several other municipalities in Bosnia. On the photo above: Supporters of the Bosnian genocide fugitive Gen. Ratko Mladic hold up placards reading ''Stay Strong General'', in front of the court building, in Belgrade, Serbia, Tuesday, April 5, 2011. Bosiljka Mladic, the wife of Europe's most wanted fugitive Ratko Mladic has appeared in a Serbian court accusing her of illegal possession of weapons, amid renewed pledges by government officials that they will arrest her husband. 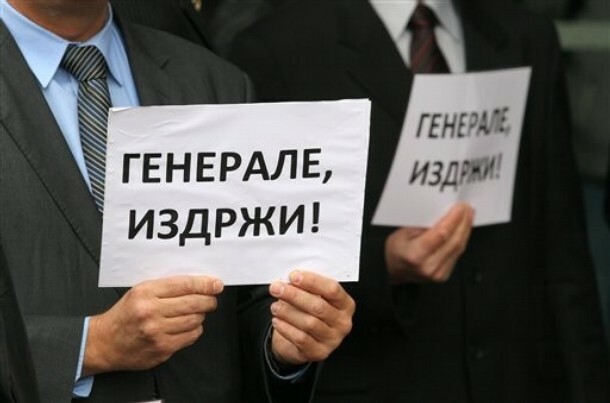 About two dozen Serbian ultranationalist racists showed up at Tuesday's hearing at Belgrade's municipal court holding banners calling on indicted Gen. Ratko Mladic to keep on hiding. Imagine? Serbian fascists -- the worst of the worst in the history of human evil -- are calling on genocidal maniac to keep hiding from justice; they celebrate genocidal monster by supporting hatred, prejudice, Srebrenica genocide denial, and virulent Bosniakophobia. The wife of Europe's most wanted war crimes fugitive, herself on trial for illegal possession of weapons, insisted on Tuesday that his husband has died (should we believe her?). As a habitual liar, Bosiljka Mladic is no different than Ljiljana Zelen-Karadzic, the wife of former Serb leader, Radovan Karadzic, currently on trial for the Bosnian Genocide (his charges include genocide against Bosnian Muslim population in 11 municipalities of Bosnia-Herzegovina, not just Srebrenica). 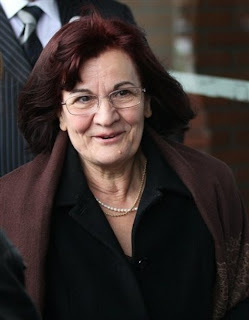 Ljiljana lied she knew nothing about Karadzic's whereabouts, a claim proven to be another lie (click here). "If he (Ratko Mladic) is alive, he would have found ways to call us," Bosiljka Mladic told the court during the opening hearing of her weapons possession case. But, we learned from earlier examples that one should never trust a word that comes from the horses mouth. Remember Karadzic's wife's lies? If now, click here to read... Ratko Mladic, a habitual liar himself, is most likely still alive and under intensive 'care' of his Serbian ultranationalist fascists who support the project of the "ethnically purified" and substantially enlarged "Greater Serbia". Bosiljka is manipulating the public opinion, hoping that the World would declare his husband 'dead' so he could avoid the prosecution. If he really 'died', his protectors would let Bosiljka know how to claim his body for a "State Funeral". Imagine all these Serbian fascists -- the evil individuals -- coming on Mladic's funeral and celebrating his genocidal deeds, including the murder of 10,000 people in Sarajevo under his command??? Imagine? Currently, Serbs are holding 49 percent of Bosnia -- ancestral land of Bosniaks and Croats (of course, Serbian history books will disagree with this statement, because Serbian history is mostly composed of ultranationalist lies. Remember Jasenovac and a lie that 600,000 Serbs died there? The US Holocaust Memorial Museum puts the figure of dead Serbs there between 45,000 and 52,000 [much less than Serbian Jasenovac myth] but the real number is 28,000 killed based on Serbian/Yugoslav statistical sources that were kept as a secret - both figures, substantially less than 600,000 Serbian lies about Jasenovac). Serbs -- who attempted to destroy Bosnia-Herzegovina in 1990s -- do not have any moral, historical, political or any other right to this beautiful country. Eventually when they decide to separate and complete the racist project of "Greater Serbia", new war will emerge and old scores will be settled. Serbs committed two genocides against the Bosniak population of Bosnia-Herzegovina -- one during World War II and one during the Bosnian war of 1990s. Should we just forget? May those who are willing to forget be eternally damned and may their offspring die of cancer. "On the other hand, out of the 31.3 percent of the population in Bosnia-Herzegovina who declared themselves Serbs in the 1991 census, about 10 percent were army officers and their families who came mostly from Serbia and Montenegro. Since the outbreak of the war, they have returned for the most part to Serbia and Montenegro. The real percentage of Serbs in Bosnia-Herzegovina is therefore approximately 28 percent, or significantly less than one-third of the 1991 population." And while Serbian fascists, continue to celebrate their genocidal "heroes", mothers of Srebrenica and Sarajevo continue to shed their tears. U.N. prosecutors believe Mladic is hiding in Serbia under the protection of wartime comrades. Mladic's arrest is a precondition for Serbia's European Union membership bid. Enough excuses Serbia; Enough empty words and promises; Arrest Ratko Mladic Now! DON'T FORGET SREBRENICA. DON'T FORGET BOSNIA.